Back to the classroom today, and was looking forward having my First and Second graders draw cave animals into clay. I knew they would LOVE it and when the time came for them to walk through the room I waited... and waited.. and waited! Where were my lovely little ones? 5 minutes went by, then 10 and now I'm panicking because I needed them for the entire 40 minutes to get through procedures and questions and art making! I eventually had to go retrieve them, realizing they were with a sub all day... and they were off the wall! There would be no clay today, I thought! So, I quickly rethought my remainder 20 minutes with them and grabbed a book off the shelf. I chose The Iridescence of Birds: A Book About Henri Matisse by Patricia MacLachlan. I knew they came to make art and not to listen to a story, so I gave them all a piece of paper and some colored pencils. 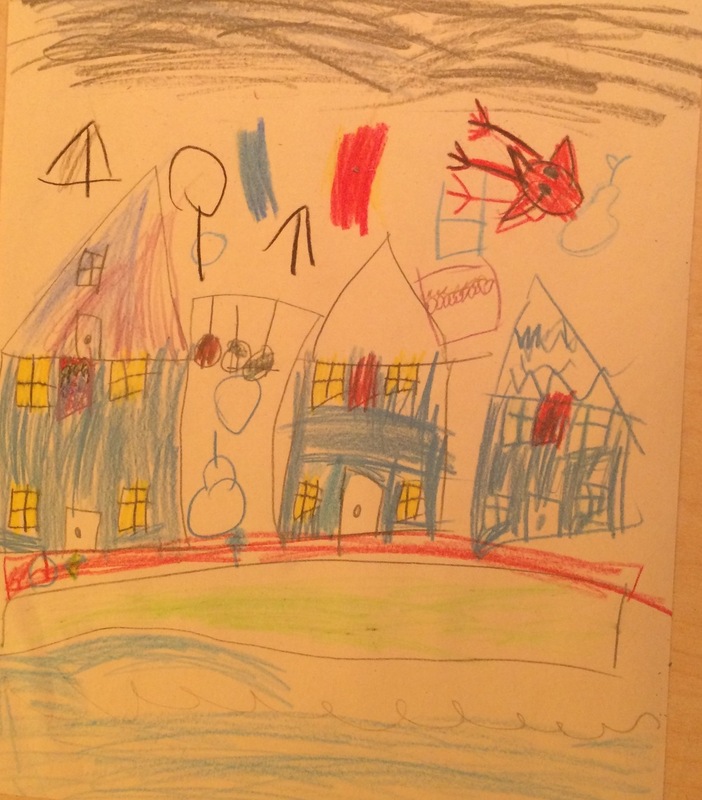 We talked a bit about the difference between an author and an illustrator. I told them they would all take on the role of an illustrator. As I read, they would draw the pictures they saw in their mind instead of looking at the pictures in the book (which are quite lovely, and will be revealed after the whole story is told). We got started and it was a hit! What was suppose to be a day full of clay ended up as a very successful drawing workout! All students eagerly began drawing after I read a few pages. They learned what "dreary" meant and what a "meadow" was. They remembered a weaving we did last year and began drawing a woven blanket. I was overwhelmed with the detail and excitement they had as they drew the pictures they saw in their mind and how well they could tell back the story by looking at their drawings! 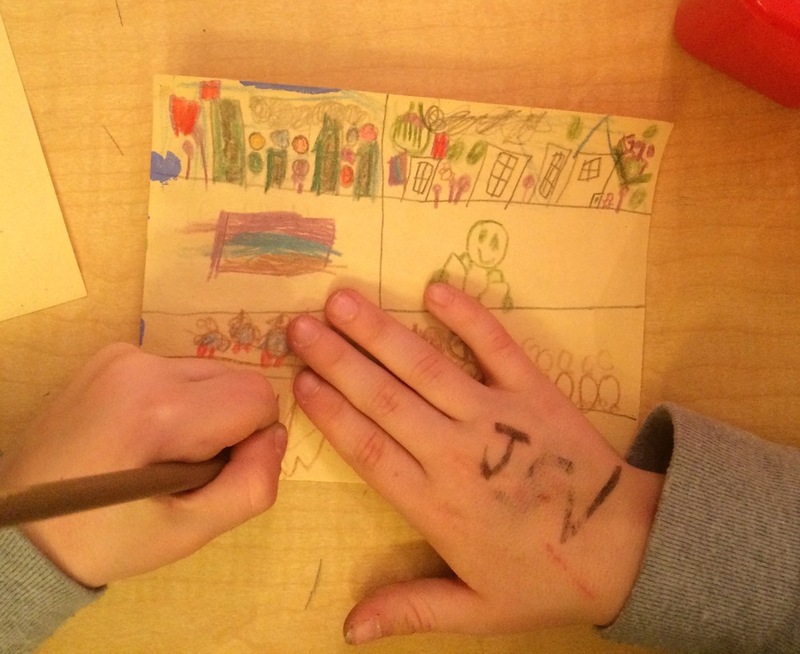 Some students even set up their page with boxes to draw their first storyboards without even knowing it! Bravo 1st and 2nd graders! How do high school students "STRETCH" before drawing their own created still lives with straight lines and blind contour drawing? My name is Carrie and I am a K-12 Art Teacher. 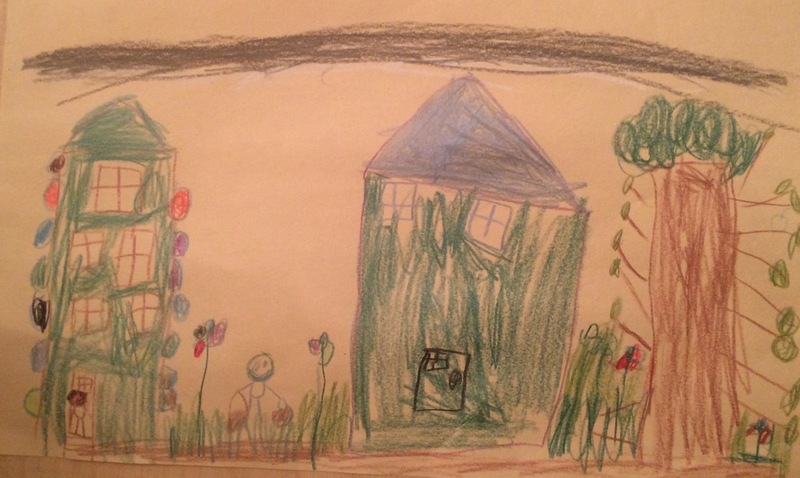 When I began teaching 3 years ago I saw a disconnect between students’ attitudes towards drawing and how it is framed within the K-12 curriculum. When students don’t know how to draw or have no confidence in their work I have observed a decrease in their creative confidence. I wondered how teachers’ and parents’ attitudes about drawing shaped our students’ desire to draw well. I believe we all have the capacity to draw and I also believe that the ability draw well can not only improve our daily lives but also improve our capacity for creativity within any profession.